The static keyword in C# declares a data member static. A static member in C# cannot be instantiated and accessed via the class name. Static modifier can be applied on data members, constructors, classes, methods, properties, and events. The static keyword can be applied to a class members including constructors, methods, properties, and events. Static can also be applied to claases. The static modifier makes an a member non-instantiable. The members of the class can be accessed via the class name (type) only. When the first instance of the class is created. A class once loaded will remain in memory permanently and also are all static members of that class. For every new instance of a class, all the instance members are allocated memory as one unit, but static field members of a class are allocated memory only once, irrespective of the number of objects created, and they are allocated memory when the class is loaded. These members are also called class members and are accessed outside the class using class name. A public static member of a class can be used as Global member of the application because it can be assessed using class name from any part of the application. It is a constructor with static keyword. It is used to initialize static members dynamically and is executed when the class is loaded. It is invoked by the CLR when the class is loaded by it and hence cannot be overloaded nor can be declared with any accesses specifier like public or private. Static members are loaded and allocated memory. Object is created and Instance members are loaded and allocated memory. 4 and 5 repeat for subsequent object. Note: Static Constructor cannot access Instance members of the class. This is because when the static constructor is executed the instance members are not allocated any memory. Static constructor can't be parameterized. A method which does not have anything to do with the state of the object can be marked as static method. Static methods and properties can only access static fields and static events. All methods and properties (procedures) of the class irrespective of whether they are static or not are allocated memory for instructions only once. Outside the class a static members of a class can be accessed using class name whereas the instance member of a class must be accessed using a reference variable referring to an object of that class. Instance members of the class cannot be accessed in a static constructor or any other static method or property of the class (unless it is qualified by a reference variable referring to an object of that class). a._Balance = 100; // IsValid because _Balance is qualified by “a” which is reference to an object. An instance member can access static members of the class. “this” cannot be used in the static member of a class. A class in C# can be declared as static and such a class can have only static members and instance members are not allowed. Also such a class cannot be instantiated. It is ideally used for managing Global data. If a static class contains non- static members, it gives an error. 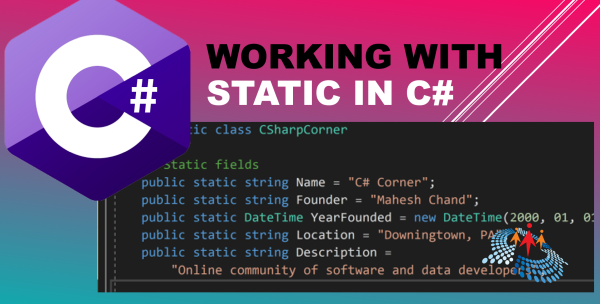 Here is a complete C# program that uses a static class with static fields, static propertiers, a static constructor, and a static method.